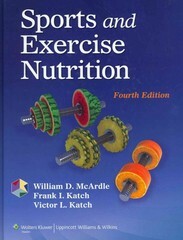 Sports and Exercise Nutrition 4 Edition Updated with the latest cutting-edge research findings, the Fourth Edition helps readers make the bridge between nutrition and exercise concepts and their practical applications. The book provides a strong foundation in the science of exercise nutrition and bioenergetics and offers valuable insights into how the principles work in the real world of physical activity and sports medicine. Case Studies and Personal Health and Exercise Nutrition activities engage readers in practical nutritional assessment problems.